An image of the original shop vac owned by Jeremy. An image of the additional accessory hose. 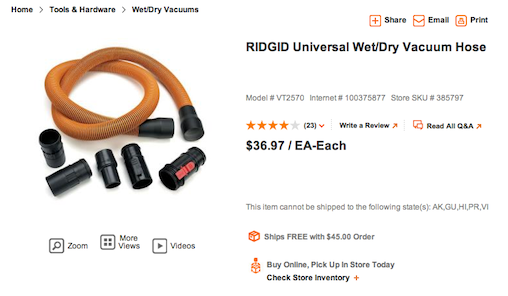 The original shop vac and hose, purchased new, total approximately $100. Both were ruined in the grease trap cleaning. 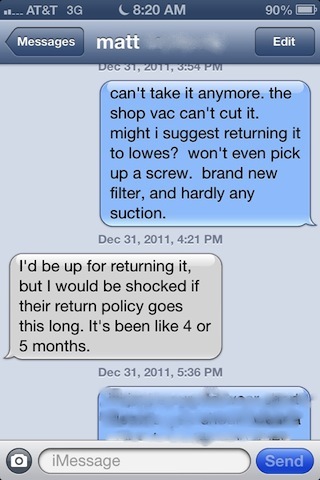 Jeremy's request to return the replacement vac. 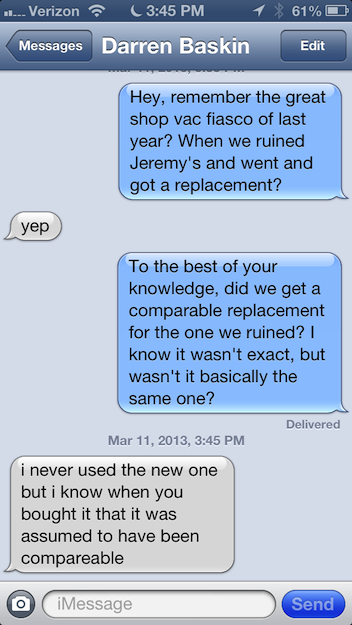 Text message from their mutual friend, affirming that Matt did buy the replacement shop vac in good faith, believing that it was equivalent to the ruined item. where is the audio and video of the public and unconditional apology? mmmmm I haven't had one in years. thanks for reminding me about them Jesus Espina. Faceless and nameless though I may be - and as insignificant as that renders my opinion - I believe the effort that Matt demonstrated to make things right was more than adequate, and he certainly owed no apologies by the time his friend had the new vacuum of his choice. Neither friend should have felt any reason to be slighted by the end, but magnification of a relatively trivial incident that is essentially resolved, and whose lessons were in the "fiasco" and follow-up themselves, now overshadows a friendship and a wedding? They both needed someone to scream at them to let it go. I've never disagreed with a judgement more.